England Under-21 international has already featured in a variety of roles for the Gunners. 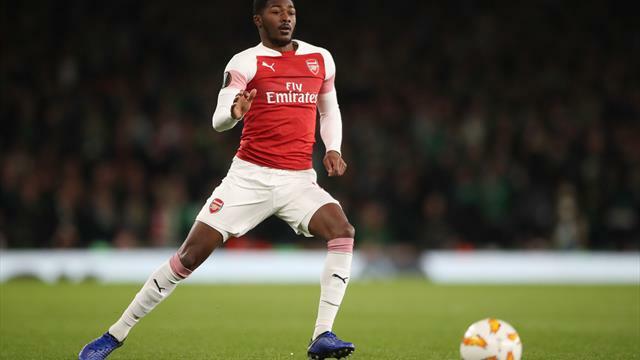 Ainsley Maitland-Niles believes he can be the answer to Arsenal’s search for a new winger. The Gunners have been linked with the likes of Denis Suarez of Barcelona and Dalian Yifang’s Yannick Carrasco, but head coach Unai Emery has admitted the club have no money to make permanent signings and will instead be shopping in the loan market. Emery has highlighted the need for a winger and has praised the versatility of England Under-21 international Maitland-Niles. He broke into the Arsenal first-team squad as a central midfielder but can also play as a full-back and has enjoyed a couple of recent games as a wing-back. However, he sees his future further forward, which could prove beneficial to Emery. “I’d like to be a winger,” he told Sky Sports. “I feel comfortable there and I’ve been playing there this season. “I was a striker growing up. Thierry Henry was the perfect role model at the time. Asked where he saw himself playing in time, the 21-year-old academy product – who scored his first Arsenal goal in the 5-1 defeat at Liverpool – replied: “I like to think of myself as a winger at 25 years old, starting every week for Arsenal, scoring and assisting goals. “I don’t feel like I’m there. I’m still young and I have a lot of learning to do. “Even if I was playing week-in, week-out I wouldn’t say I was there because the learning stage I am at now, I still have so much more to give to the game. Maitland-Niles is in a battle to be in Emery’s side for Saturday’s Premier League clash at West Ham. Arsenal have six players back from injury with the likes of Hector Bellerin and Mesut Ozil pushing for recalls.